Get your free cleanup kit now to start making your community clean and safe. Reno, Nevada. April 23, 2015. No one knows your community better than you, and there are many things you can do to create a cleaner, safer, healthier community. Washoe County wants to inspire residents to become stewards of their parks, neighborhoods and community use areas, so with our partners we established the “Make it Clean, Keep it Safe” Program. Studies show crime is less likely when a neighborhood is clean, well lit, and used frequently by families and neighbors. But it can't happen without you! Free, Litter Cleanup Kits, containing the basic necessities for individuals and/or groups to clean and maintain their identified community use areas are available now. Citizens can pick up their free Litter Cleanup Kit at their local Library, Washoe County Complex, Parks Department, Washoe County Sheriff’s Office or Keep Truckee Meadows Beautiful KTMB. All community members receiving a kit(s) will be asked to report basic demographic information such as: name, contact info, number of bags collected, hours dedicated to cleanup, cleanup site(s) and number of participates. Kits will consist of a reusable litter bag filled with gloves, garbage bags, compostable dog waste bags, a litter pick-up tool and instructions, cleanup reporting form, safety rules and a resource guide for future cleanup efforts. 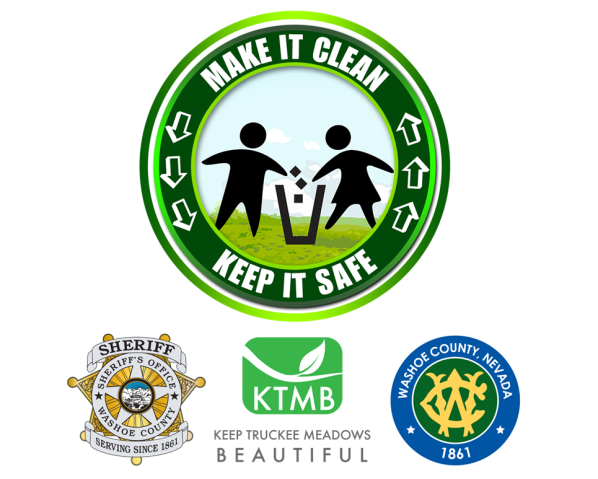 We encourage local schools to organize and participate in a County-wide "Make It Clean, Keep It Safe" Community Cleanup on May 16 from 9 a.m.-noon. This activity is designed to provide hands-on experience engaging and educating students and their families about the importance of a clean, safe community. Keep Truckee Meadows Beautiful (KTMB) has developed an entire curriculum, including the Waste Warriors video, specifically for educators in Northern Nevada to download and use, free of charge. To make this event a success, Washoe County will donate 1,000 Student Cleanup Kits to schools willing to participate, free of charge. Student Cleanup Kits will be disbursed on a first come, first served basis and contain supplies for 10 participants to complete a cleanup: reusable tote bag, gloves, garbage bags, instructions, cleanup reporting form, safety rules and a resource guide for future cleanup efforts. There is a limit of five kits per school, enough supplies for 50 participants. Please visit http://ktmb.org clean-safe or e-mail SO-OutreachPrograms@washoecounty.us.